Cinco de Mayo. One of the first parties I hosted ever. Borris and I got a house after classes were over for spring classes. We then decided to throw a Cinco de Mayo party. We weren’t 21 yet though, luckily Ryan was! So he got us the booze. How things have changed 12 years later. 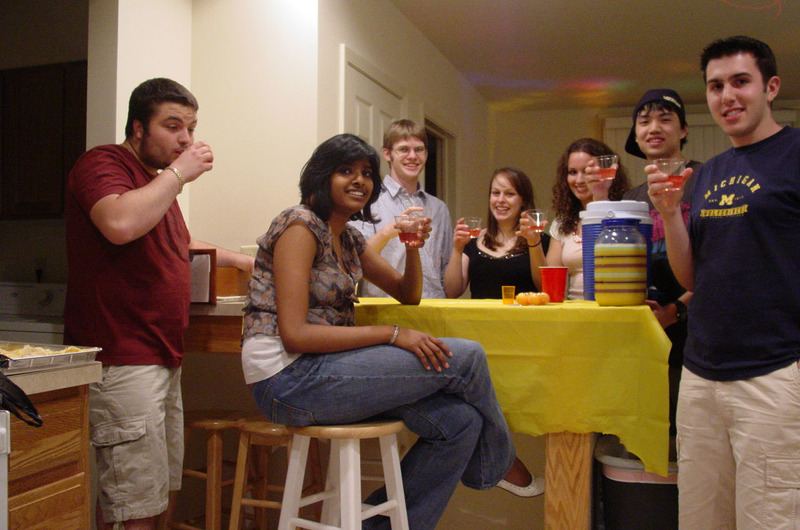 I threw a Cinco de Mayo party annually for a while, but had stopped. Since I realized I was basically throwing a party every season, I figured I’d reinstate the Cinco de Mayo party for the spring. Dante had brought over a lot of the tequila that had been being stockpiled at his house. It turned out we had about 10 different tequilas. Ryan asked if there was a prize if he had one shot of each tequila. I told him an 11th shot of tequila! We made that a reality. He made punch cards, and I have to say he really outdid himself. I made some taco dip for the party and got the chili-lime chips from Honeybee. They are amazing. I also ordered 100 tacos to be catered for the party. I was happy that they mostly all got eaten. That would’ve been a lot of leftovers that I did not want to deal with. Sure it would’ve been fine for a day after or even 2. But if I had like 60 tacos left, I don’t think I would have been taco’d out which is super sad to think about. The turnout was great! I did well pacing myself; I wasn’t about to have another New Year’s Eve Eve type of night. It really wasn’t until Dan arrived and brought out the watermelon that he made when things got a bit shaky. This devil fruit was deliciously dangerous. Dan told me he was going to make his famous watermelon jello shot thing. It sounded marvelous. I was excited. It was delicious. Then about an hour or two after he arrived and I had eaten 5 or 6 of these things, I heard him say “I used two fifths of vodka for this”. That’s when I knew things were going to be a bit iffy. I just started drinking water mostly for the rest of the night. I started a fire and we all hung out around it. It was a great night for it, not too chilly but also not too warm. Eventually I wanted to get on the roof and hang out/drink. We did. I don’t really remember taking some of these pictures, but I remember the circumstances. I love being on my roof. It was a great party. Super successful. Not sure that I want to throw it again next year. We’ll see, maybe with some tweaks (re: no Tequila Challenge).